This time of year there's a lot of focus on football, food and being thankful. While most of your employees are probably looking forward to the holiday you should be looking for ways to show them how thankful you are for all of their hard work this past year. Unless your business is a sole proprietorship you have employees who contribute to your overall success. Your business depends on their efforts. Taking time to say thanks before the hustle and bustle of the holidays is a great way to show your appreciation and keep morale high. 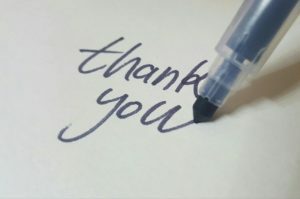 Keep reading for some creative ways to show your appreciation and tips on how Stockpile simple free inventory system can solve your inventory issues. For those employees who shine the brightest you can say thanks with a gift of a pocket sized flashlight, a desk lamp, or other small light. Include a clever gift tag with a saying like "Your enthusiasm always shines through!" A tube of lip balm is a great gift as you head into the winter months. If you go with Burt's Bees balm you can include a buzz worthy pun like "Thanks for BEE-ing so special." Most people run on caffeine. If you have a lot of coffee lovers on staff a gift shop to a local coffee shop can be a great choice. Include a card that says "Thanks a Latte for all you do," and you're sure to get a chuckle out of the recipients. A cute jar of mints with a note that says their efforts have "MINT a lot" is a sweet way to say thanks. You could also choose some other candy to fill the jar and change the note to say "You're so sweet" or something similar. If your staff is more health conscious and wouldn't appreciate a high calorie dessert you could always gift them with a jar of nuts. Dress it up with a tag that says "I'd have gone NUTS without all your help this past year." Trail mix with a card that says "Thanks for keeping us on the right path," is also a fun way to say thanks. If individual gifts aren't really your style you can always do a group thank you such as ordering breakfast or lunch for your staff or just hosting an afternoon ice cream social. The important thing is that you take a moment to let your staff know how much they mean to you and how important they are to your overall success. Don't assume that they already know. Everyone likes to hear it every now and then. Remember, right after the holidays they're going to be thinking about New Year's Resolutions and you don't want "find a new job" to be on their list. Of course if inventory issues are causing your staff headaches they may already be thinking about that anyway. Thankfully, there's Stockpile. Stockpile is the inventory management solution that your small business needs. Creating item records is quick and easy. Stockpile is fully customizable so you don't have to worry that it won't work for your particular business. Plus, it's scalable so it will grow with your business. Tracking items is easy whether you have one location or dozens. Mobile compatibility allows you to access records from a mobile device and you can run reports with just a few clicks. Why suffer with inventory issues when you can solve them all with Stockpile? The best part is that Stockpile is available for free. Now that's something to really be thankful for. Have more questions on how Stockpile can work for you? Check out our tutorials and our blog. We have tons of posts on how to use Stockpile. Ready to get started? Try Stockpile today!